This report presents the results of our review of the U.S. Postal Service Government Relations and Public Policy Office’s (Government Relations) responsiveness to congressional requests. Government Relations receives congressional requests from members of Congress or chairmen and ranking members of oversight committees and subcommittees. Some requests are informal, such as telephone calls or emails. Government Relations also receives “questions for the record” (QFR), which result from congressional hearings. Government Relations assigns personnel to research, write, and review responses within 10 business days. Postal Service field offices also receive congressional requests on local issues. 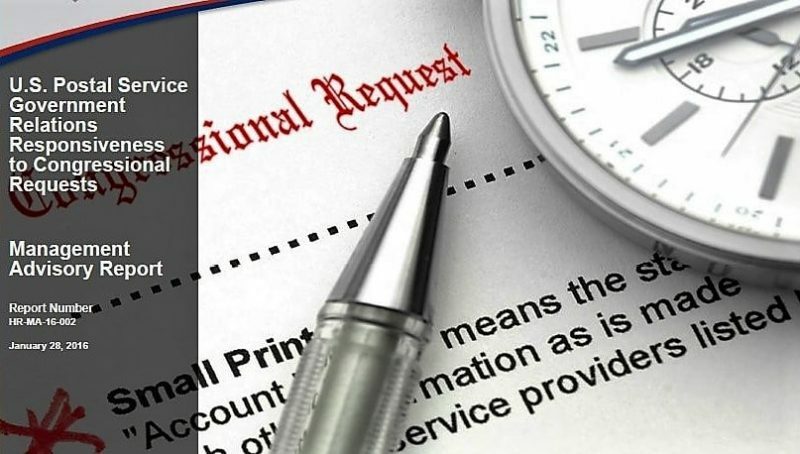 They are authorized to respond to these requests directly within 7 business days. Our objective was to assess Government Relations’ management of congressional requests and inquiries it received from fiscal years 2011 through 2014. During that time, Government Relations received over 18,500 congressional letters and 12 QFRs. Of the 210 cases we reviewed, 143 congressional requests were submitted directly to and responded to by Government Relations. The mean, median, and mode response time for the 143 cases were 10, 10, and 11 business days, respectively. Other Postal Service departments received and responded to the remaining 67 requests. Government Relations did not consistently respond to congressional requests in a timely manner. Of the 143 requests, Government Relations did not respond to 25 requests (17 percent) within their internal goal of 10 business days. These responses ranged from 1 to 41 business days late. The mean, median, and mode response time for the 25 late cases were 20, 14, and 12 business days, respectively. In addition, we could not identify the date of receipt for 49 of 143 requests (34 percent) because the date stamps were missing or illegible. Further, Government Relations did not account for the time between the date the request was received and the date it was assigned to personnel, which ranged from 1 to 27 days for the remaining 94 requests. The mean, median, and mode for these cases were 6, 4, and 2 business days, respectively. Had these days been included, the response delays would have been greater. Government Relations also did not always document the date of all requests including emails. While we recognize that not every form of correspondence (such as telephone calls) needs to be documented, it is important that essential elements, such as the date a request is received, are tracked. Additionally, of the 143 requests, we found only one case where Government Relations notified the requestor when it received such a request and did not advise requestors of any time delays. We also reviewed 12 QFRs and found that, although Government Relations responded to all of them on time and requested extensions when needed, its policies and procedures for responding to QFRs were not in a formal, published format to ensure continuity of business processes. Finally, the Postal Service policy does not prioritize requests from individual members of Congress and instead treats these requests as if they were submitted under the Freedom of Information Act. This policy does not recognize individual Congress members’ need for information to carry out their legislative duties. Procedural discrepancies contributed to the delays and we did not find any evidence that the Postal Service intended to be nonresponsive. Government Relations’ practice was to start its 10 business day clock when a request was assigned to personnel based on staff availability and workload. Its standard operating procedures did not address when to start the clock for responding to congressional requests or require personnel to document request dates, acknowledge receipt of requests, or notify requestors of delays. Five federal agencies we benchmarked against had published policies for responding to congressional requests and began counting their response period the day they received the letter from Congress. Two agencies date stamped correspondence or recorded the receipt date in their tracking system, two acknowledged receipt of emails, and two notified requestors of delays. Two of the five agencies published their procedures and response times for QFRs in a formal correspondence handbook. Without specific policies, Government Relations may delay responding to congressional requests, which could negatively impact relations between Congress and the Postal Service. In addition, Government Relations should carefully consider any requests received from a member of Congress to enhance transparency and strengthen relations between Congress and the Postal Service. We recommended management develop and publish internal and external policies to include, but not limited to, starting response periods when requests are received, establishing response due dates, date stamping incoming correspondence, documenting the date of request for all incoming email requests, sending notifications when requests are received or responses will be delayed, and responding to QFRs. We also recommended management revise policies to designate requests from individual members of Congress as having appropriate priority to promote transparency and positive relations. This entry was posted in General Union Business, Postal Reform and Politics and tagged Congressional Requests, Government Relations, management incompetence, nonresponsive, QFR, questions for the record, transparency, usps mismanagement, USPS OIG Audit Report. Bookmark the permalink.